The Mendocino Coast is dotted with hamlets that feel (charmingly) out of sync with the 21st century–places where swooping gulls and hidden coves compensate for the spotty cell coverage. But if you want to balance walks on the beach with a pint and a search for artisanal housewares, Fort Bragg is the spot. With around 7,000 residents, it’s not huge, but that still makes it the county’s biggest coastal city. Here, festive tie-dye and utilitarian fishing jackets mingle at restaurants serving the day’s catch alongside jaw-dropping ocean overlooks. And whenever the confines of civilization start to grate, expansive redwood forests are just a stone’s throw away. 9 A.M. At Eggheads Restaurant (707/ 964-5005), an offbeat local’s spot with a Wizard of Oz theme, dig into an omelet loaded with Dungeness crab from Noyo Harbor. 10:30 A.M. Walk down the street to Roundman’s Smoke House (), beckoned by the smell of meat, fish, and cheese smoked on-site. You’ll be able to get everything you need for a picnic. 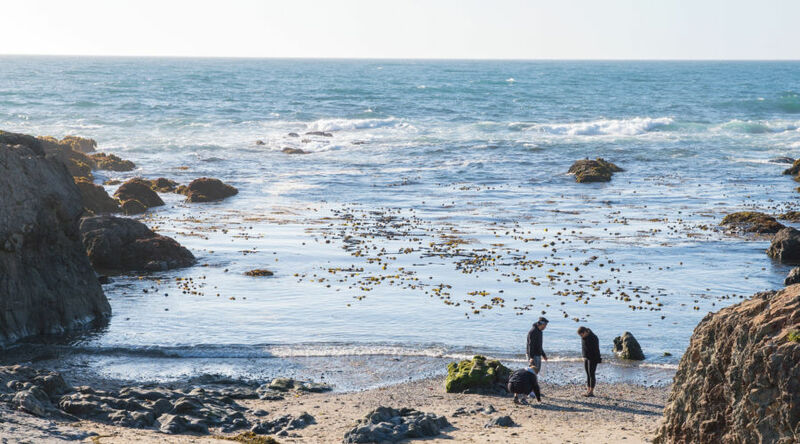 11 A.M. From Elm Street, follow the well-worn path toward Glass Beach in MacKerricher State Park () and pick through the translucent blue, white, and green sea glass–remnants of thousands of old bottles tumbled smooth by the waves. Up above you’ll find the Noyo Headlands Coastal Trail (), completed this March. Hike along the bluffs and grab a picnic table when you’re ready for lunch. 1 P.M. Reward yourself with a few macarons from A Sweet Affair () back on the main drag. Then drive a few minutes up the coast to Ricochet Ridge Ranch ($60; ). Although it’s sometimes possible to join at the last minute, reserve in advance for a one-hour horseback ride on a sandy beach. 3:45 P.M. Many folks move to the area to get away from it all, but when they leave their hillside idylls, they come to town to shop. At Barge North Company (), browse coast-ready gear like comfy flannels and textiles from Portland’s Appetite. Then hop over to Dot + Twine (707/ 962-3023) for towels silk-screened by local artists and Fat and the Moon all-natural beauty products, many infused with organic herbs. 5:30 P.M. Head to buoy-draped Sea Pal Cove (707/ 964-1300) down at the harbor and dig into fish and chips or a bowl of family-recipe clam chowder while watching sea lions follow incoming boats. 7 P.M. Mendocino’s damp forests are one of the West’s great mushroom-hunting grounds. What does that have to do with dessert? At Cowlick’s Ice Cream (), order ice cream flavored with foraged candy cap fungi. Fans swear it tastes like maple syrup. Happy trails, indeed! Этот авторитетный веб портал , он рассказывает про уборка снега с крыш.